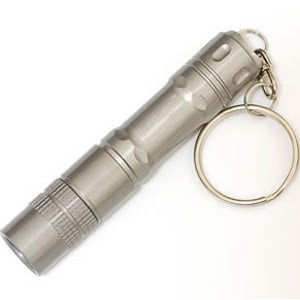 This is a AAA flashlight from Huntlight, it uses a 1 watt Luxeon, either a R-bin or a S-bin LED depending on the model, the R-bin can produce up to 45 lumen for 1 hour and the S-bin about 60 with a slightly shorter runtime. The body is HA-III anodized aluminium resistant to scratches and all sorts of impacts, the switch is a simple twisty; twist the head for on/off operation. The light can stand on its tail to be used in candle mode, the small split ring allows the flashlight to be attached to a keychain or other attachment points/lanyards. It can use alkaline, rechargeable NiMH or Lithium AAA batteries, the lenght is 7cm slightly bigger than an Arc AAA. Among the AAA flashlights the S-bin model of this flashlight is probably the brigthest even brighter than a Fenix L0P. It has a very particular beam with a strong hotspot and a very wide corona so it can throw quite well and can also be used as a task light. The price is $33 for the R-bin and $54 for the special edition S-bin. You can find more information and order from JSBurlys Flashlights. The pilot is a small backup light for headlamps. It comes with a small base that can be attached to the bands of a headlamp, it can also be attached to straps in a backpack. The light is a simple 5mm led powered by two 2016 coin cell batteries, it is very small and produces a decent amount of light. The pilot has two modes of operation constant-on and flashing, the runtime is 14 hours in constant-on and about 36 hours in flashing mode. The pilot can be useful to change batteries in your headlamp or as an emergency light if your headlamp runs out of batteries or has some failure, it is good to search for things in a backpack or a pocket without removing your headlamp. The pilot is available in red, green and white and costs $9, you can read more in Princeton Tec website or order it from Lighthound.